This monograph is the outcome of an American Geophysical Union Chapman Conference on longitude and hemispheric dependence of ionospheric space weather, including the impact of waves propagating from the lower atmosphere. The Chapman Conference was held in Africa as a means of focusing attention on an extensive geographic region where observations are critically needed to address some of the fundamental questions of the physical processes driving the ionosphere locally and globally. The compilation of papers from the conference describes the physics of this system and the mechanisms that control ionospheric space weather in a combination of tutorial-like and focused articles that will be of value to the upper atmosphere scientific community in general and to ongoing global magnetosphere-ionosphere-thermosphere (MIT) modeling efforts in particular. A number of articles from each science theme describe details of the physics behind each phenomenon that help to solve the complexity of the MIT system. Because this volume is an outcome of the research presented at this first space science Chapman Conference held in Africa, it has further provided an opportunity for African scientists to communicate their research results with the international community. In addition, the meeting and this conference volume will greatly enhance the space science education and research interest in the African continent and around the world. 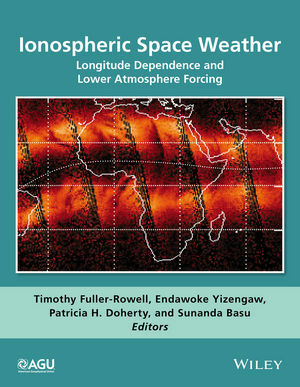 Ionospheric Space Weather: Longitude Dependence and Lower Atmosphere Forcing will be useful to both active researchers and advanced graduate students in the field of physics, geophysics, and engineering, especially those who are keen to acquire a global understanding of ionospheric phenomena, including observational information from all longitude sectors across the globe. Dr. Tim Fuller-Rowell is a Senior Research Scientist and a Fellow of the Cooperative Institute for Research in Environmental Sciences at the University of Colorado Boulder. Tim has contributed book chapters in the AGU GM series and journal articles in AGU journal JGR and Geophysical Research Letters. He has co-edited an AGU volume in the GM series.